For any aspiring authors who spend their working lives reluctantly sitting in an office, Steven Hague is something of a role model. Steven spent a decade working in Norwich Union’s marketing department, eventually specialising in writing reports on the stock market. But while he enjoyed his time with the insurance giant, it wasn’t quite how he had imagined his life would turn out. “From a young age being a writer was just a dream I had, in the way that other people say they want to be a rock star or a footballer,” he says. So after taking redundancy during one of Aviva’s shake-ups, Steven decided to focus on realising his ambition of becoming a novelist. When he and his wife Lisa prepared for a summer holiday, he decided to dispense with taking the usual paperbacks to read on the beach. “Instead of doing that I took a pen and a pad and gave it a go, and it started from there,” he says. The result, three years down the line, is his debut novel, Justice For All, which has had very positive reviews. The Daily Mirror picked it as one of its three recommended summer reads for men and Arena magazine has named Steven as one of the best new British crime writers. It’s a pacy, page-turning read that’s hard to put down. Zac Hunter is an ex-cop in Los Angeles, who has just been kicked out of the department for attacking the lead suspect in a string of child murders. When the suspect walks free on a technicality, Hunter vows revenge and becomes a private investigator, but his decision to turn vigilante puts him in the sights of a ruthless assassin. “Viktor Danilov has killed more people than he cares to remember, in more ways than he cares to describe, but his life, which he once ruled with iron-fisted precision, has suddenly spun out of control – being on the run from the Russian mob was bad enough, but his new boss makes them look like a bunch of boy scouts,” as the publishers, Mira Books, put it. Throw in a hot-shot lawyer named Rebecca Finch who has dedicated her life to defending the accused but finds herself taking on a case that forces her to examine her conscience, and you have the makings of a vintage piece of hardboiled crime fiction. According to the Mirror it’s “a debut of the highest order…uncompromising from start to finish” while The Bookseller calls it “gritty US urban noir”. 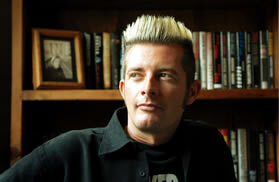 It is part of a proposed trilogy – Steven has already finished the second book, which is set for publication next year with the title Blood Law, and he is well into writing the third – with just a little help from the other members of his household in Thorpe Hamlet, Norwich. 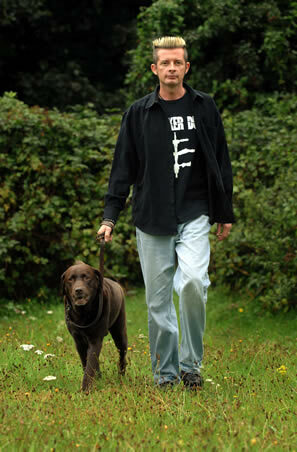 As well as being dedicated to Lisa, who he says is “my harshest editor”, Justice For All also includes a credit to his dog Murphy, a chocolate Labrador, who turns out to have a vital role in Steve’s writing process. Steven is 36 and grew up in the city; he’s a regular at Carrow Road, went to Hellesdon High School and had his first job working at Asda’s fruit and vegetable section while he was a student. And in a neat example of things turning full circle, he will be back at the Asda store on September 27 – but this time as a published author, giving a book signing session between 11am and 12.30pm. Justice For All, by Steven Hague, is published by Mira Books priced £6.99. Article and photographs reproduced by kind permission of the EDP. All content copyright Archant. To visit the EDP24 website click here.